Sen. Linares said both GE and Aetna talked about the need to attract younger workers as a reason to move to another state. That is why Connecticut must take steps to keep more of its college graduates in the state. 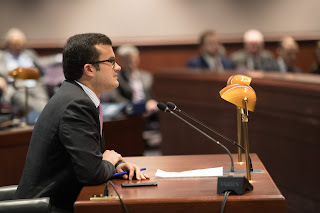 Sen. Linares said the legislation also makes it easier for students to purchase less expensive, electronic textbooks, and reduces red tape when state colleges and universities enter into contracts with private businesses. This will speed up the process and reduce administrative costs, which should help control tuition costs. “I believe this bill could serve as a pilot program for helping schools build better partnerships with the private sector,” he said. Sen. Linares serves the communities of Chester, Clinton, Colchester, Deep River, East Haddam, East Hampton, Essex, Haddam, Lyme, Old Saybrook, Portland and Westbrook.